What are you and your friends wearing when you go to the gay or lesbian night clubs, gay pride or when you're just relaxing around the house? Our gay t-shirts, lesbian t-shirts, sweatshirts, baseball jerseys and caps show your personality, your preferences or your wild side. No matter where you are, our shirts will get you noticed. Gaylesbiantshirts.com is gay and lesbian shopping at its best. Our original designs celebrate our lesbian and gay identities while making a statement. Our designs have captured the gay and lesbian lifestyles. How do we know? Our entire staff is either gay, lesbian or bisexual and we wear our t-shirts and other merchandise with pride. We know you will too. 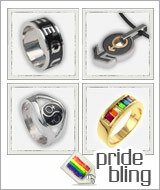 Gay, lesbian and bisexual t-shirts and accessories express your pride and your personality. Our designs allow you to be yourself, define your character and make your friends and family laugh. Even wear one when you visit bisexual escorts London. Find the perfect item for yourself or for someone you know. To begin shopping, click on the Start Shopping link or choose a design category above.